Richard “Scott” Tice, 62; of Oswego passed away at University Hospital, Syracuse after a long illness. He was born in Oswego, NY to Richard and Dawn (Pelkey) Tice currently of Oswego. He has remained a lifetime resident of Oswego. Scott had worked at Nine Mile, Scriba, NY as a Nuclear Operator for 30 years. He was an active volunteer fireman with the Scriba Volunteer Fire Department, Granby Volunteer Fire Department, and a member of the Fire Brigade with Nine Mile. 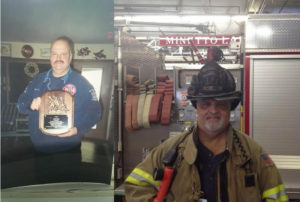 Scott was a Minetto Volunteer fireman, past chief and a NYS Fire Instructor. He was also a trainer at Onondaga Community College, and at Nine Mile. Scott was a past member of the Oswego County Hazmat Team. He was a hard worker who enjoyed old cars and Scott was happiest riding his motorcycle or fishing. I remember Scott fondly from our high school days. We always exchanged kind words, and many barbs, and laughed alot. I do remember that we traveled with different circles of friends, but never lost our connection with each other. It’s very sad that time and distance severs the chance to trade a casual barb or friendly hello, but it does. I will remember Scott and my other fallen classmates. I wish you peace old friend. Thoughts and prayers are with you Jill. It has been a hard journey. Scott has fought the good fight. God bless you and family.